Michael Viglietta finds language all around him, as evidenced by the snippets of text prevalent in his mixed-media paintings. But it’s his own internal dialogue that whispers to us in this exhibition, beckoning us to consider our own mental and emotional landscapes. 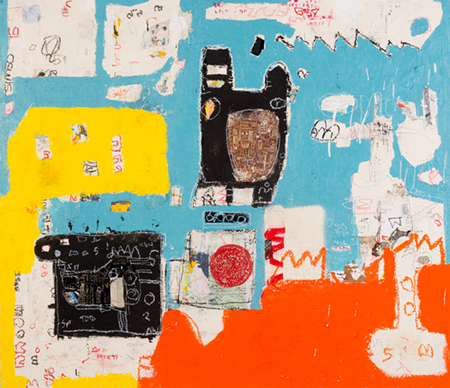 Eighty of his works hang salon style, on gallery walls, panels and columns, creating a landscape that teeters on the thin line between order and chaos that’s also at play in the artist’s creative process. He builds up, he tears down. He lifts materials such as latex paint, paper and wax from one work, and places it onto another. They’re layered, lifted, burned, scraped, sanded and weathered by water or sun. Taken individually they hint at particular moments in the artist’s life. Collectively, they signal life’s messiness, filled with small steps forward, sudden shifts in direction, and dramatic falls into the unknown. The context for this exhibit is a once-lauded arts district that has been radically transformed through rampant development in recent years. The stories of this place, and the artists so integral to having transformed it, are being erased, cannibalized and exploited. But Viglietta’s work also calls upon us to consider the ways perilous times can prompt critical course corrections. The aesthetic use of repetition and autobiography is a way of self-soothing the artist’s personal anxieties. His is a visual language that traffics in rumination and a quest for solace. Images may start as a representational narrative, then often veer into abstraction. The works split more or less evenly from an intimate scale, from around 10 by 12 inches, to a larger 58 by 64 inch range. Playful, evocative titles such as “Barbarians for Dinner,” “Undertow” and “The Pilgrims” lend them an appealing storytelling character. Far from despairing the changes Viglietta’s work wrestles with, this exhibition is about coming to grips with shifting new realities. These are paintings about adaptation as an essential survival skill, with a subtext for viewers that we too will find our own way.